This tutorial will show you step by step how to change the chat screen background on WhatsApp on an Android phone. You can change the chat screen wallpaper for all your contacts (default) or just for one contact. This tutorial works for all Android phones such as the Samsung Galaxy, Sony Xperia, Huawei, Lenovo, Motorola Moto, OnePlus, Google Nexus, HTC, LG, and other smartphones. WhatsApp allows you to make your chat screens more personal by using background images or by using your own personal pictures as a background on the chat screens. You can change the default chat wallpaper for all contacts or just for one contact individually. 2. Tap on the menu button. 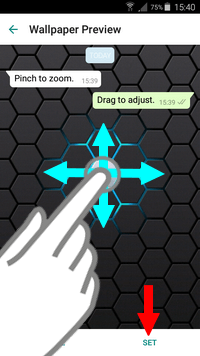 For many Android phones, the WhatsApp menu button is a physical button on your smartphone located at the bottom left or bottom right, and for some phones, the menu button is in the top right corner of the screen. The icon for the menu button will look different on different phones. 6. Go to the location on your phone (phone memory or SD card) where the image is stored you want to use as your new custom background for your chat screens. 7. Tap on the picture. 8. Drag the photo to adjust to the screen. Tap on the image and swipe with your finger to the left, right, top or bottom until the image is how you want it to be. 9. Tap on SET located at the bottom right. 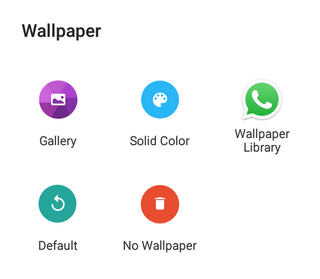 WhatsApp will save your chat window background. 2. Open a chat with the contact for who you want to change the chat background (you don't need to type anything). 3. Tap on the menu button. 5. Go to the location on your phone (phone memory or SD card) where the image is stored you want to use as your new custom background for your chat screens. 6. Tap on the picture. 7. Drag the photo to adjust to the screen. 8. Tap on SET located at the bottom right. WhatsApp will save your chat screen wallpaper.